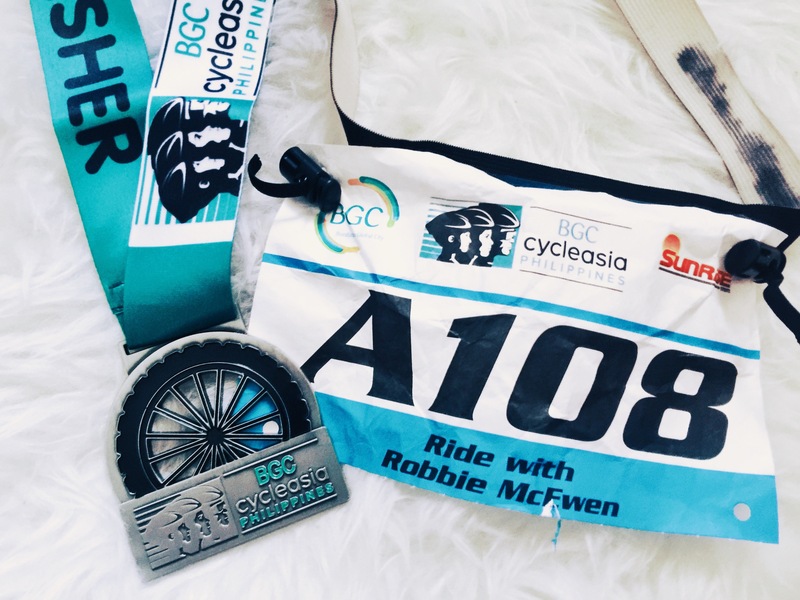 Yesterday was such a special treat because not only did I get the chance to meet and ride with Australian former cycling pro & three-time Tour de France winner Robbie McEwen, but i also had the privilege of doing that 40km course with my dad by my side. 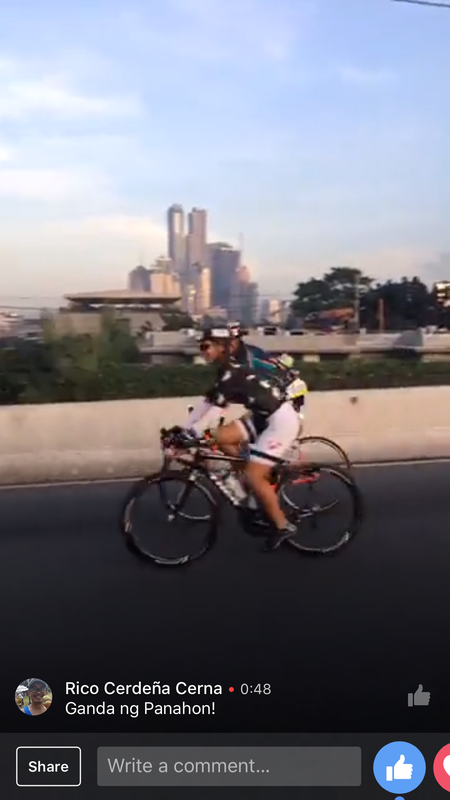 Early that morning, I made sure to get to the starting line way before gunstart, waited for my dad, and made sure I had brought with me his bike nutrition (an energy bar), his race belt, and bike emergency tools (co2 and pitstop). 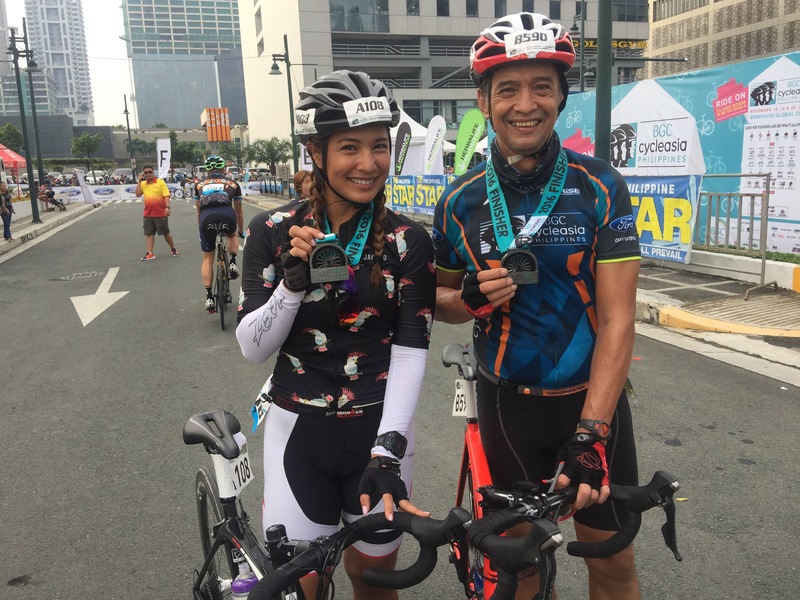 It was the first time my dad and I were riding together so this was an extraordinary bike ride for both of us. As the gun was shot, off we went. 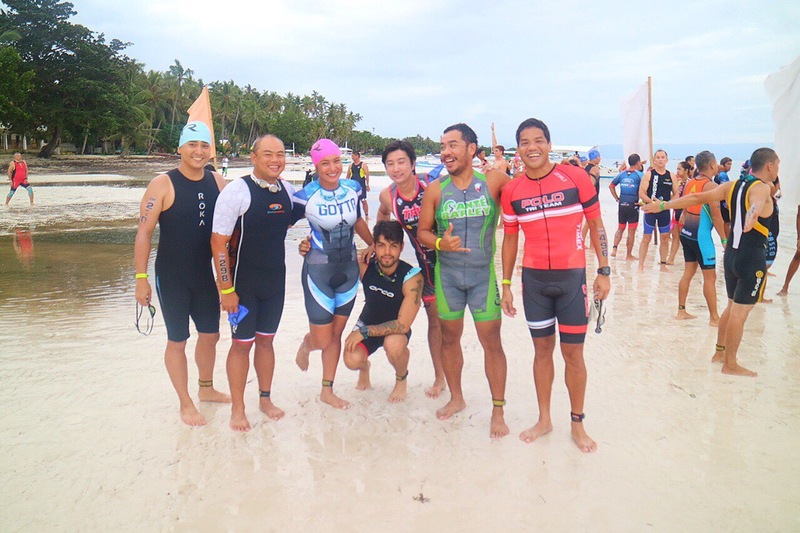 We were surrounded by the full force of the Polo Tri Team and those guys were fast! It was a test of willpower and tons of EQ for me as I wanted to push, go fast and try to chase them (keyword: try) but I knew I had to stay by my dad’s side. Having suffered from a bad crash caused by his heart stopping a few months ago, the doctors told my dad to ease up on the bike. Meaning, he can’t quite raise his heart rate anymore. Only slow, steady rides for him. He knew I liked going for speed..told me I could race it and just leave him, and just wait for him at the u-turn. But I couldn’t, wouldn’t and didn’t. What if something happened to him in that few minutes that I’d leave him? I was not going to risk that. Besides, the only reason I joined this was so that I could ride side by side with him anyway! The course was easy and beautiful. 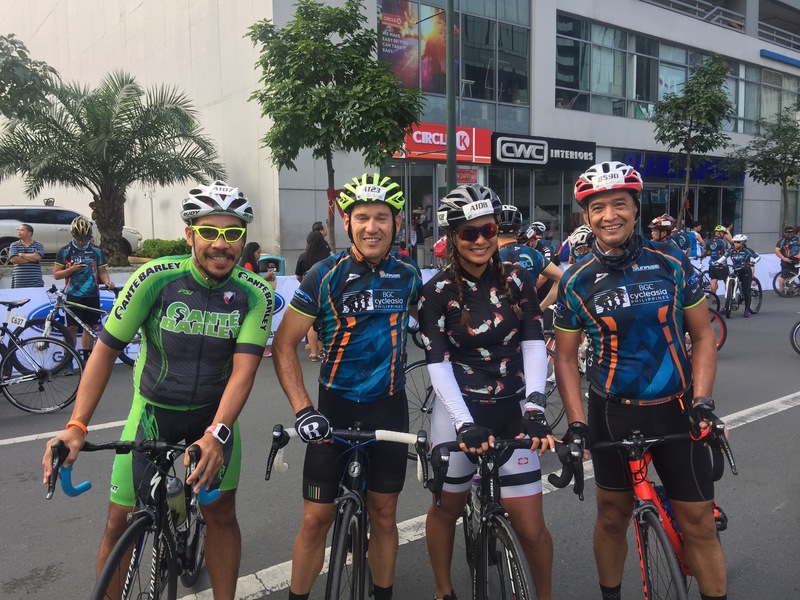 Having the roads of BGC, buendia and roxas all to ourselves, my dad told me stories about his old biking adventures the whole way. Other bikers would pass us, as we would also pass some bikers… we didn’t care about speed, just biked merrily. My dad admitted to me as we climbed the last flyover that he purposely didn’t wear his heart rate monitor just so that he won’t panic if his HR goes up by just a bit (which would cause him to stop); But he looked like he was having fun so I was the least bit worried. On the last 10km we found my good friend & Tri trainingmate Jonah so he caught up with us and stayed by our side. Upon reaching the last 5 km, Robbie showed up beside me and paced with us too! How awesome right? He said we looked like a group he would cross the finish line with. An hour and half on the course and we crossed the finish line, all four of us, me, my dad, jonah & Robbie, with big smiles on our faces. Yes, it was probably one of my slowest rides to date but I wasn’t doing this to PR anyway. This was perhaps one of the best (if not THE BEST) dad & daughter bonding experience I’ve had with my dad. Such a priceless experience that I wish to get to do over and over again. Yup, the medal that we got in the end may just be a piece of metal, but what it represents is something I will forever cherish. 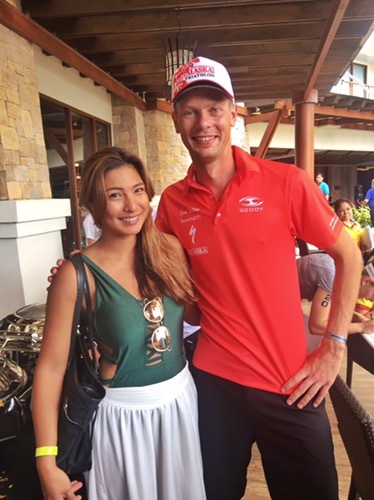 Big thanks to Princess Galura & Sunrise Events for organizing this well-executed event! 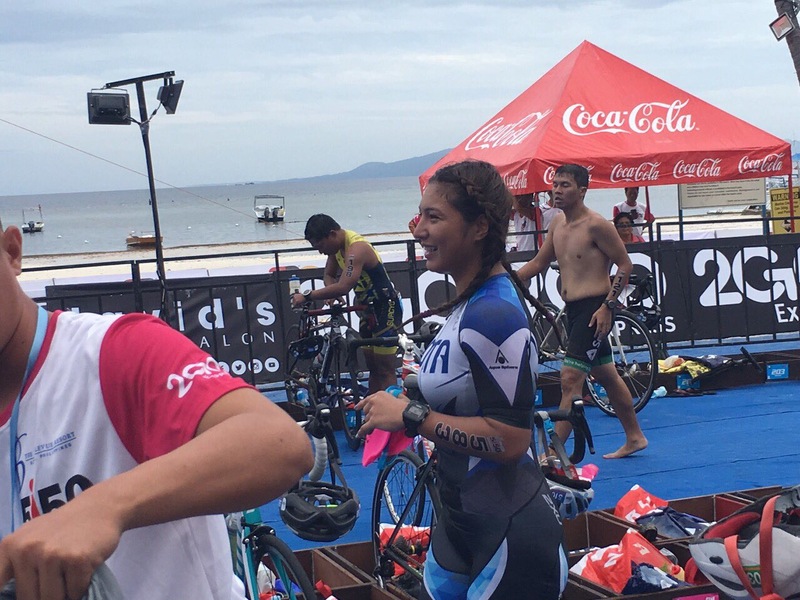 5 months ago, I posted about my first ever triathlon relay experience, and a lot has happened ever since. 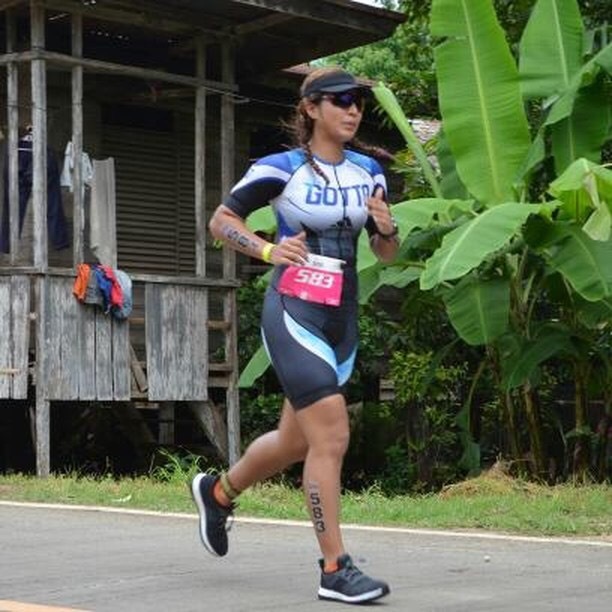 After dipping my toes into triathlon via that relay wherein I did the 10km run part, I wasn’t planning on getting fully into triathlon until maybe next year. But the universe had other plans for me. 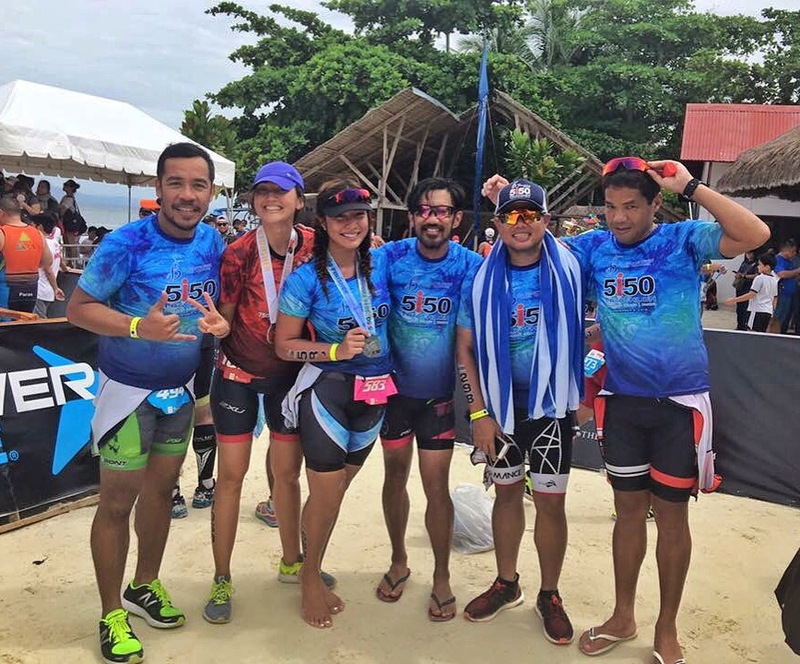 As I was training to do the run part once again, for another triathlon- the Ironman 70.3 in Cebu this time, the biker of my team had a bad bike crash and fractured her hip. She was therefore unable to fulfill her role in our team anymore. Having been kinda training on the bike anyway, Our team captain decided that I’ll do the 90 km bike course instead. The delicious 2nd place podium finish whet my appetite to maybe do all three already. 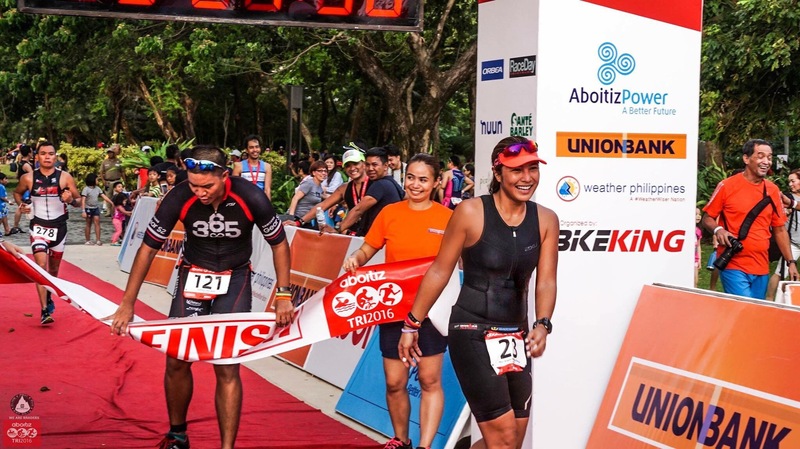 Three weeks later, I did my first ever triathlon via Aboitiz 5150 in Pico de Loro. 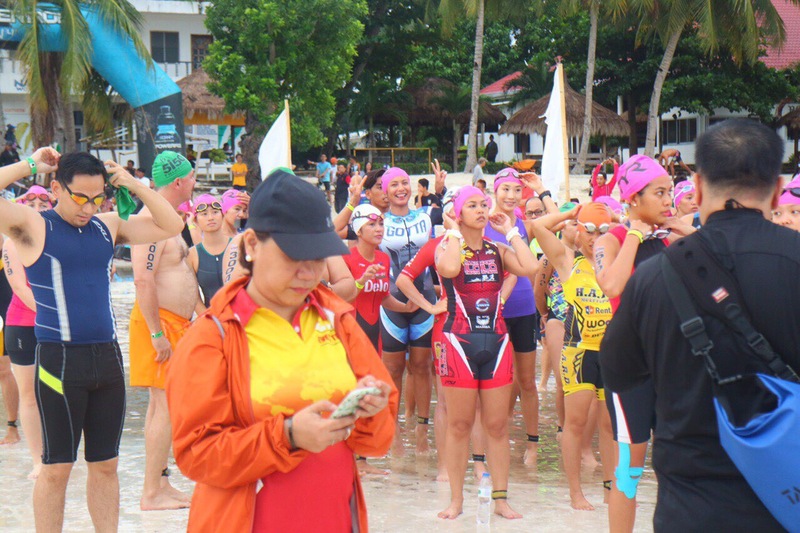 It having only been 3 weeks after cebu, I wasn’t really trained for it. I just did it Coz I wanted to, much to both my coaches’ chagrin. I had only learned how to sight the day before, so me almost drowning in those large swells was perhaps expected. Even before doing Aboitiz 5150 though, I already knew I was going to do Bohol. My training days leading up to this race weren’t exactly the best. 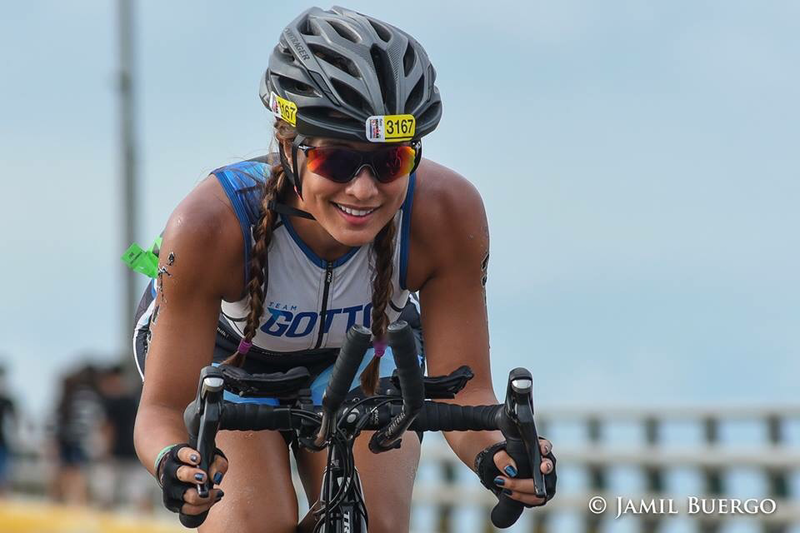 I suffered a nasty bike spill on the 2nd of October making me unable to train completely for a week and a half, and was only able to swim twice the whole month. I also fell ill and was coughing even until I got to Bohol. On the day before race day, I tried to swim, bike and run, only to have a head on collision with a fellow athlete in the middle of the ocean and thus having my face get a huge scratch by the eye because of it, got stung by a jelly fish on the leg, stepped on an urchin on the way out of the water, and to top it all off, began my moon cycle. Perhaps a normal person would think that all of these setbacks happening to one person was either a sign not to race anymore or is the universe conspiring against her. But I’m not normal. I’m weird and perhaps, crazy. I thought that this was the universe challenging me and testing my spirit. I’m a fighter, always have been. Nothing will stop me from racing and chasing that endorphin high. It also helped that I had just finished reading Chrissie Wellington’s book, so to say I was inspired was an understatement. 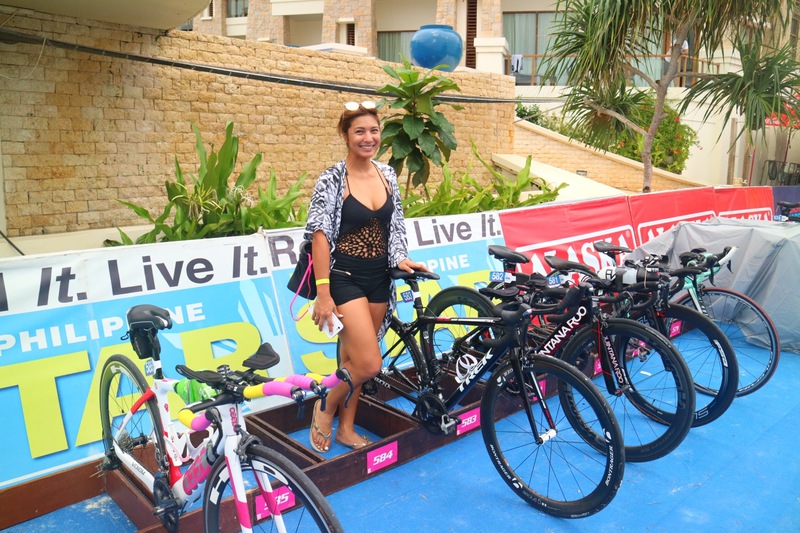 It was a beautiful day on race day – it had just rained the night before so although our bikes were completely drenched and the roads a bit slippery, the cloudy day was perfect. I woke up feeling good, and oddly calm. Why was I so damn calm? Having such a bad day the day before, I was set to believe that the universe will be a lot nicer to me today. It should be. I had my pre-race brekkie of oats, nuts, fruit & superfood with 2 cups of coffee, took my Optygen, and went on my way to transition to put my things in my box. 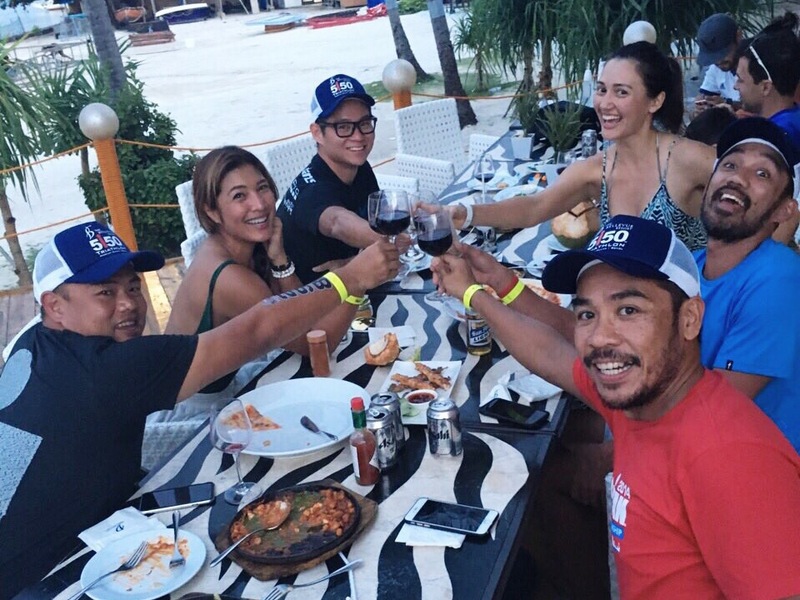 My friends, who all belonged to other teams, and I had a group prayer before heading to our respective waves and then we were off. It’s my second triathlon race to date, but my first for it to be early morning and first deep water swim start. I ws nervous about drowning even before the gun was shot. 43 mins later, I was out of the water, but time had counted the minutes where we were walking onto the shore, which was extremely long so I made it a little less than 50 mins.. Given the amount of swim I was able to clock in prior to this race, I was just happy to have survived it. I’m always happy when I’m on the bike so the 40km flat course had me smiling the whole time. It was mostly cloudy with a bit of rain for a couple of minutes but I managed to clock in 1:18. Again, I kept wondering why I was oddly calm. The run course was painful. Not because of anything else but the fact that I could still feel that sea urchin’s needle poke my foot every time my right foot landed, I started coughing again, and my tummy started cramping. Why, of all days did my moon cycle decide to begin yesterday?! I tried to ignore everything I was feeling and pushed til the finish line. 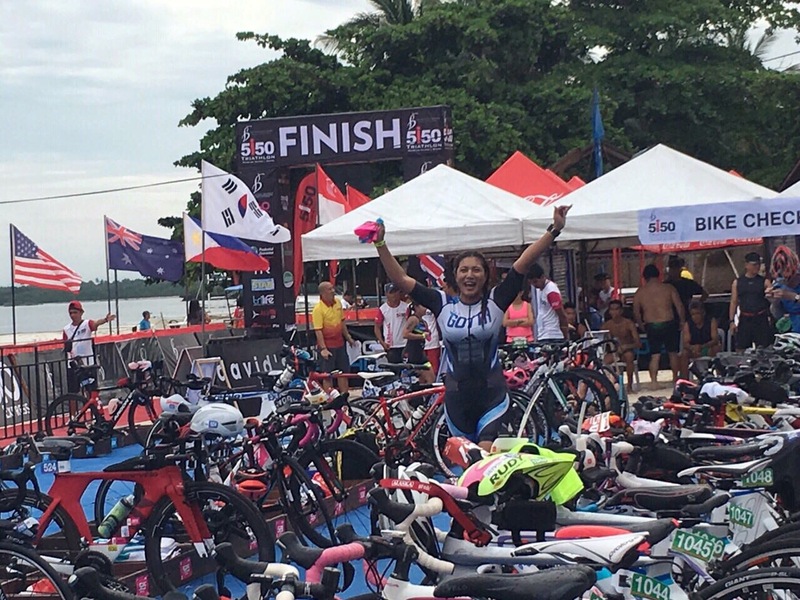 After exactly 3 hours and 20 mins of swimming, biking and running, I crossed that sought after finish line and placed 4th in my AG. An unexpected strong finish, having only wanting to finish smiling given my circumstances. Oddly enough, I didnt cry like how I did on my first tri. But instead, I just let out a huge exhale, shook my head and smiled. Oh what an exhilarating feeling!! 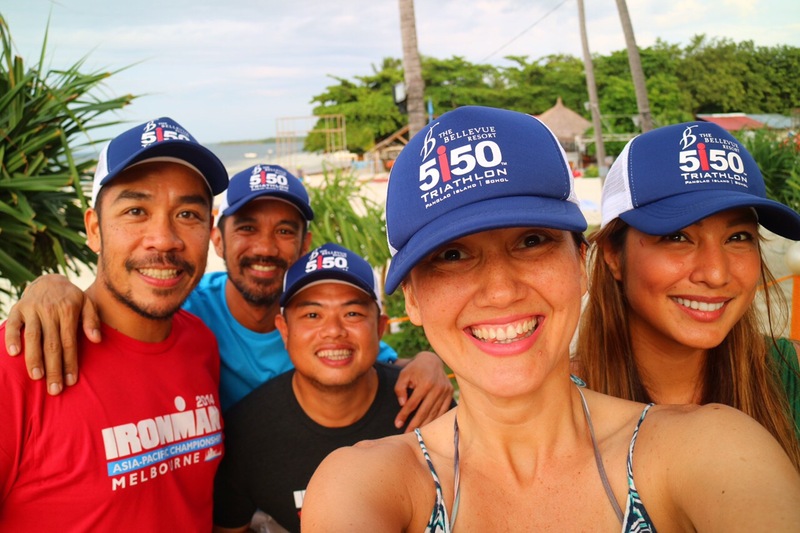 I looked for my friends immediately after, and our endorphin high had us enjoy the rest of the day laughing and talking about the race that was. I also met Sam Betten, the back to back champ of Bellevue 5150. Ironically enough, he was also the champ of the Regent 5150 5 months ago, yup the first one I dipped my toes into. I was already in awe of his speed and strength then, and nothing has changed til now. I was fangirling and starstruck to say the least. Why do we do this to ourselves? Why do we pay to swim, bike and run our hearts out? Why do we push ourselves to the limit? 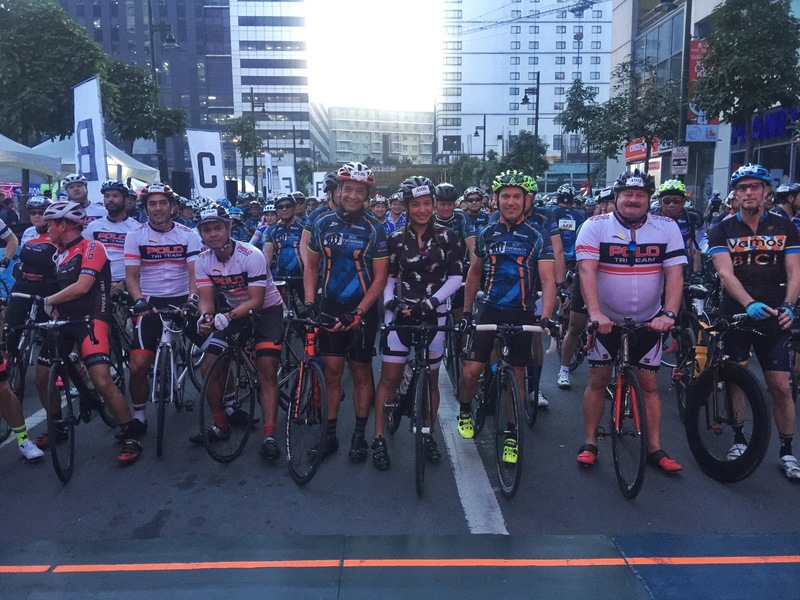 A huge congratulations and thanks to Sunrise & Bellevue for this well organized event! The course was beautiful, everything about it was obviously well planned. Perfect race for a newbie like me.